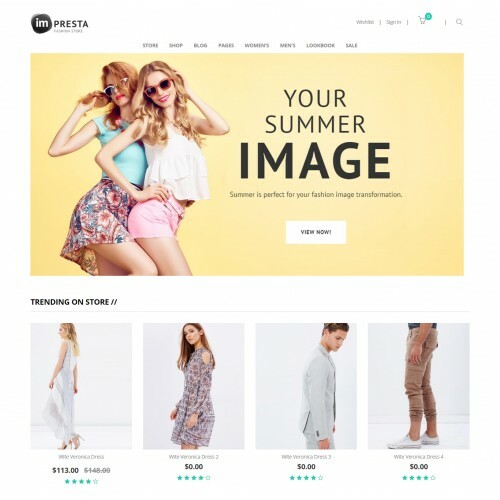 Opencart themes is a clean and elegant design suitable for selling clothing, fashion, high fashion, men fashion, women fashion, accessories, watches, jewelries, shoes..... It has a fully responsive width adjusts automatically to any screen size or resolution. Even though OpenCart Themes is the youngest among the e-commerce platforms in this article, it has already proved itself as a top choice. It promises a user-friendly experience. Opencart themes is also simple to configure and easy to customize. Home page is designed eye-catching with slideshow above and below Mega Menu. Slideshow is great with smooth transitions of texts and nice images. Mega menu supports links to products categories and internal links, external links. CMS blocks with beautiful images below the popup of some categories or arranged among opencart themes extensions are also highlights in this opencart themes template. Thumbnail image of each category and name of that category are displayed stunningly. Posts, comments, feedback, Twitter help you serve and support customers better. Besides, many opencart themes extensions are integrated in this theme to support your store such as : Layered Navigation, Ajax Add To Cart, Featured Slider, Sale Products Slider, Related Slider, Moreover, you can upload rotator image for each product image to promote your store and attract more customers. Get easy user guide for opencart template framework. Easily customize using the framework. Installation of template is easy process. You can set how many products per row. It can adapt to any screen resolution. Display detail information of a product. Display mega menu with a horizontal navigation. Columns modules and static blocks are arranged dynamically. Multi Layout style available multiple choices. Display featured products in slider. Easy to custom and config. in admin panel. Work with any languages installed in your Opencart. Show special products per row slider. Category with thumbnail image are show is sophisticatedly and beautifully. Compatible with all browsers such as Firefox chrome and safari…. More tightly and logically with new bootstrap3 and CSS3. Our support team guarantees to respond you with 24*7 working hours from Monday to Friday. You click on above Get support button. We will process tickets and respond you to in the queue order. Opencart Development services is our devotion towards fulfillment and compelling desire to serve our customers to their ultimate satisfaction. Our Opencart developer customization services includes Opencart free themes development, Opencart themes customization, Opencart free extensions development, Ongoing Opencart Support and maintenance. The precise alteration in your current e-commerce website development that enables you to leverage the power of fully interactive websites. If you are, then we would be delighted to extend our user-friendly assistance of innovative OpenCart development services for the good of your business. We have the Opencart developer to use the utterly innovative & experimental excellence for creating e-commerce websites designs that stand distinctively on the web.